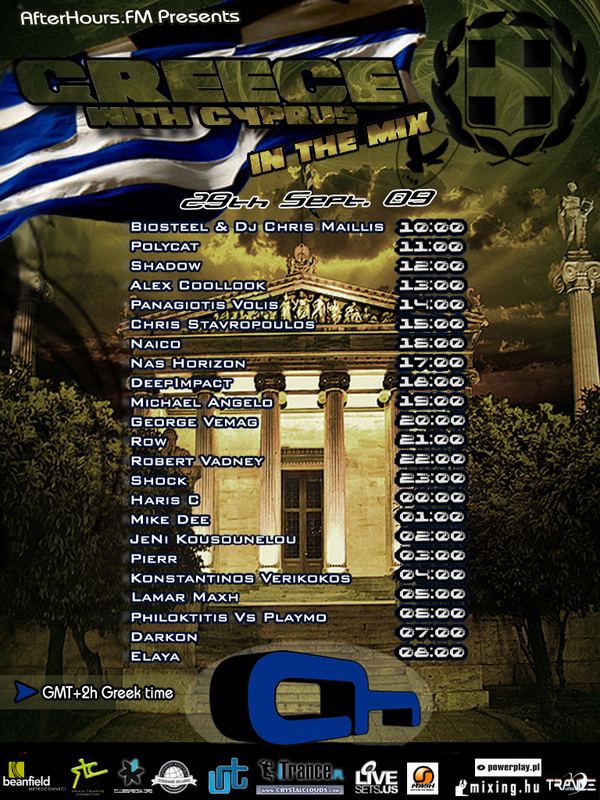 Afterhours.FM is proud to present first ever Greece in the Mix 001, massive lineup both from Greece and Cyprus. Last edited by trancefan0883; Apr 25th, 2012 at 10:20.
im surprised i know some of the djs in the tracklist, Haris C, Deep Impact, George Vemag, Michael Angelo, Robert Vadney. The good musician, i will necessarily listen. Last edited by PooNyk; Aug 29th, 2009 at 07:55.
and we have another one!!! i only know 2 djs on the list but ill be here...count me in! Yoohooo, really looking forward to this event. I don't know much Greek DJ's and their tracks, so this event will be a surprise for me. congrats! !i will try to tune in for this!!! So our neighbours will have a special spot on AH.FM too eh :D Thats nice. This will be a solid mix I think. I'm proudly from Greece so it'll be nice to hear what my country has to offer. Can't wait to hear it! I'm unsure of the time it'll play. I'm on the east coast of the US which is -5 GMT. Can anyone clarify the time for me? Last edited by Sovereignty; Aug 31st, 2009 at 17:31.